Go off the beaten path on this tour of Myanmar. Rising only recently from centuries of isolation from the rest of the world, southern Myanmar offer incredible landscapes, cultural delights, relics of colonial heritage and hidden jewels to travelers. Yangon is the erstwhile capital of Myanmar that still proudly lives on as the country’s commercial hub. 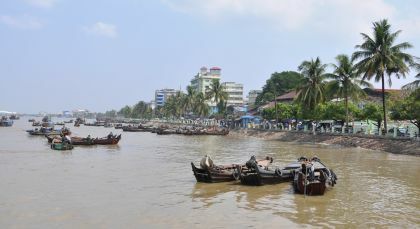 After a leisurely breakfast, drive from Yangon to Thanlyin (formerly Syriam), a major port city located across the Bagor River and home the country’s largest port. Visit Kyaik-khauk Pagoda, built during the Buddhist era 241 by Cula Thirimasoka, the Mon King of Thaton. Queen Shin Saw Pau’s stone inscription mentions that 18 successive kings of Thaton and Sre Kestra are believed to have repaired, renovated and maintained the structure. Next, visit the unusual third century BC temple, Yele Pagoda on Kyauktan Island, housing an impressive collection of paintings, sculptures and other fine demonstrations of Burmese Buddhist artwork and craftsmanship. Drive back to Yangon by afternoon to visit Chaukhtatkyi Pagoda, featuring a 216ft long – Myanmar’s largest – image of the reclining Buddha. Observe its ‘glass made’ eyes and how human they look! Later, visit Bogyoke Aung San Market (formerly Scott’s Market) known for its colonial architecture and cobblestoned inner streets. This market is a major tourist draw with its antiques, Burmese handicrafts, jewelry shops, art galleries and clothing stores. Notice also shops for locals selling medicine, foods, garments and foreign goods. Drive from Yangon to the base station of the Golden Rock in Kyaiktiyo via Bago (160 km, 5 hours). From there it goes by a local truck further (about 1 hour). If you want, you can also go the last stretch on foot (about 20 to 30 minutes). The sacred rock of Kyaiktiyo is situated in the midst of densely wooded mountains. 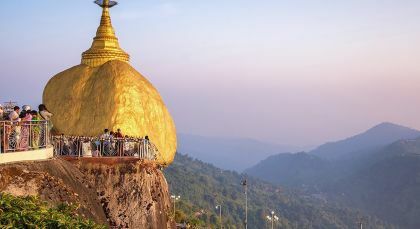 Trek uphill to admire the amazing and almost gravity-defying Kyaiktiyo Pagoda, or Golden Rock of Kyaiktiyo. A renowned Buddhist pilgrimage site, this temple was built on top of a massive granite boulder that has been painted in gold leaf and shimmers beautifully throughout the day. There are many legends to the pagoda and some believers say it is precariously perched on a strand of Buddha’s hair, which was given to a traveling hermit who passed it to a king who constructed the pagoda with his supernatural powers. 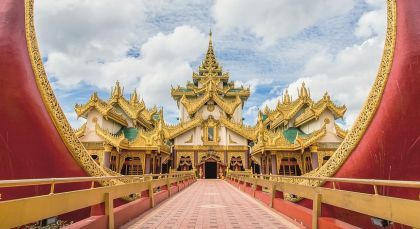 En route to Yangon, you can also visit the ancient Royal City of Bago (Pegu), which boasts the old palace, a giant Buddha statue and one of Myanmar’s highest pagodas. Burmese Bago, formerly Pegu, is a port city in southern Myanmar situated on the Pegu River. It is located 80kms/50miles NE of Yangon, and was the 13th century Mon kingdom capital. Bago is famous for its religious atmosphere, surrounded by the ruins of its old wall and moat, once forming a square on all sides. 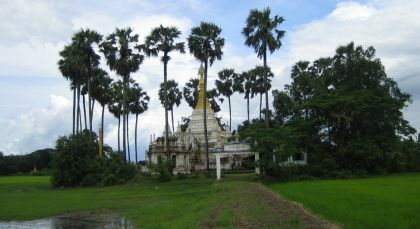 A significant rice and timber collecting center and also having several mills and sawmills, there are many sights within and around Bago. Choose from the Shwethalyaung Reclining Buddha Image, Shwemawdaw Pagoda/’Great Golden God Pagoda’, Kanbawzathadi Palace, Kyaikpun Pagoda with four gigantic Buddha images seated back-to-back against a brick pillar, Kalyarni Sima/Ordination Halls for the Buddhist Order, Myatharlyaung Buddha Image, Hinthargone Pagoda on a hillock with magnificent views of Bago, Moeyungyi Wetland Wildlife Sanctuary (near Bago). Hpa-An, also known as Pa An, is a charming town and capital of the Kayin state, located north of Mawlamyine and near to the Thai border. Hpa-An is famous for caves, hillside Pagodas and colorful markets. 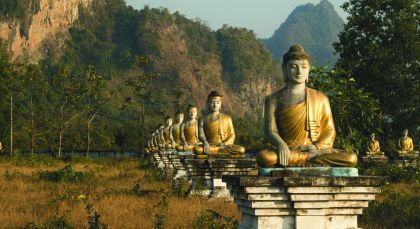 Noteworthy places to explore are the Kyauktan Ye Le Pagoda with its impressive collection of artwork; the historic natural limestone Kaw Goon Cave; and the Lumbini Garden that boast 1,000 Buddha images. See also the Kyauk Kalap Monastery; the Bayin Nyi Cave, perched atop a hill having a large entrance chamber filled with many statues; and the Shwe-yin Myaw World Peace Pagoda at the bank of Thanlwin River. Mawlamyine (formerly Moulmein), is the fourth largest city in the heart of Lower Myanmar, 3kms southeast of Yangon and 7kms south of Thaton, at the Thanlwin river mouth. Sounds scary? Worry not, there are no ogres. Instead you’ll discover a captivating self-sustaining island habited by Mon natives. Take a private boat along the mighty Than Lwin River to Bilu Kyun or Ogre Island. Several dozen villages dot the island, where expert craftsmen hone their ability to transform raw goods into daily necessities. Cottage workshops produce handmade smoking pipes, pens and rubber bands that are sourced from nearby plantations. Coconut fibre-mats and inspired creative cutlery, teapots small toys, walking sticks and slate are just some of the things you can watch being made. Visit one of the teakwood monasteries or meet fishermen who dive for long periods of time under water – locals say they have secret fins. Visit the local market in the morning and glimpse slivers of vibrant local life in this harbor township; drive past beautiful colonial buildings, ancient mosques, Indian temples and churches; visit U Zina Pagoda, U Kanni Pagoda, Kyaut Ma Yaol (Marble Buddha Image), and Mahamuni Paya located atop a mountain with panoramic views of Mawlamyine. Visit the Sein Done Monastery, originally the residence of the Queen, where the corridors are lined with carved figures and interiors are decorated with floral designs. Visit the landmark Kyaikthanlan Pagoda. Dawei is trading hub set deep in the south of Myanmar, at the mouth of a river estuary. Hidden under a lush canopy of swaying coconut palms and tall betelnut trees, this quaint town is a refreshing change from the busier destinations in Myanmar. 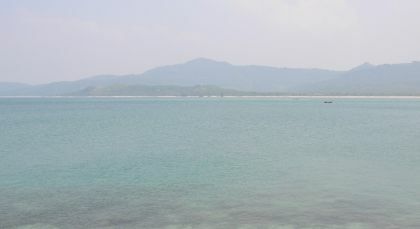 Myeik is a charming coastal city by the Andaman Sea, located in the heart of southern Myanmar. Owing to its strategic location between China and the Middle East, Myeik has enjoyed the position of a prominent international port, offering safe harbor to many an illegal vessel in the past. 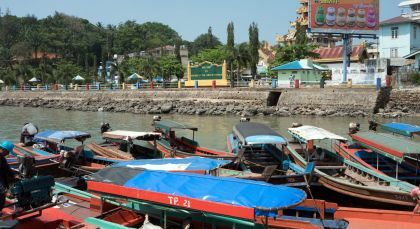 Kawthaung is Myanmar´s southernmost city where you can cross the border to/ from Ranong in Thailand. 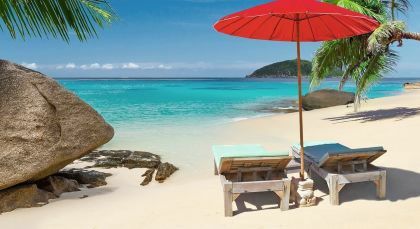 Khao Lak is Thailand’s tranquil seaside destination and home to many beach resorts. Accommodation (on a twin-sharing basis) on the indicated meal plan for 16 nights.